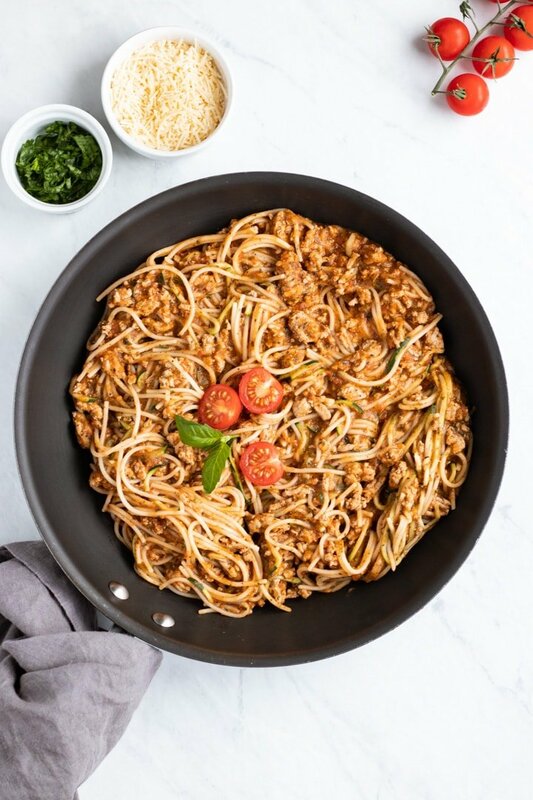 This delicious Low FODMAP Spaghetti and Zoodles recipe is an easy FODMAP-friendly take on the Italian classic with an added boost of veggies. When I worked a supermarket dietitian, I had the pleasure of helping people from all walks of life. Some days I was helping college students find healthier choices on a budget. Other days, I helped people with celiac disease find gluten-free alternatives for their favorite foods. Each day was different. But one of my favorite topics was introducing people to fruits and veggies and showing them fun ways to enjoy them, like zoodles! If you’re not familiar, zoodles are spiralized zucchini or zucchini noodles! More and more supermarkets are carrying pre-made zoodles, but you can also make your own. Currently, I use a spiralizer. They’re usually about $20 and can be used to spiralize all kinds of fruits and veggies. Or, you can use a vegetable peeler. This is what I used before I got a spiralizer. The “noodles” will be wider and a little bit thinner than spiralized zucchini, but they’ll still resemble noodles and you likely have a vegetable peeler already in your kitchen! Zucchini can be low FODMAP, but it’s one of those foods where serving size matters. Per Monash University, zucchini is low FODMAP in small servings of ⅓ cup, diced, or 65 grams. The FODMAP Friendly Food Program has also tested zucchini and they give it a pass at a slightly larger ½ cup or a 75-gram serving. If new to FODMAPs and in the elimination phase, I would invite you to err on the more conservative side until you’ve assessed your individual tolerance level. Larger servings do contain enough fructans that may trigger symptoms for some folks. If you’re a big fan of zucchini or other foods that have smaller low FODMAP serving sizes (apples, peaches, peas, etc. ), it can be helpful to have a food scale. Now, I’m not suggesting you need to weigh and measure everything (unless that’s your jam), but a food scale can help you more easily enjoy these borderline FODMAP foods in “safe” serving sizes. Cook spaghetti according to package instructions. Once done, drain, rinse, and toss cooked spaghetti with a little olive oil to help prevent pasta from sticking together. While pasta is cooking, heat 1 tablespoon of garlic-infused olive oil in a large skillet over medium-high heat. Once hot, add leek leaves and saute, stirring occasionally, until leek leaves are bright green, fragrant, and soft. Carefully transfer sauteed leek leaves to a blender. Add tomatoes, basil leaves, tomato paste, Italian seasoning, (optional) red pepper flakes, and salt to the blender. Blend until smooth. Set aside. In now empty pan, heat remaining 1 tablespoon of garlic-infused olive oil over medium-high heat. Once hot, add ground turkey and brown, breaking apart into crumbles, until cooked. Add tomato sauce from blender and bring to a boil. Reduce heat, add cooked pasta and spiralized zucchini, and stir until well coated. Serve warm topped with optional garnishes. Make This Even Easier? 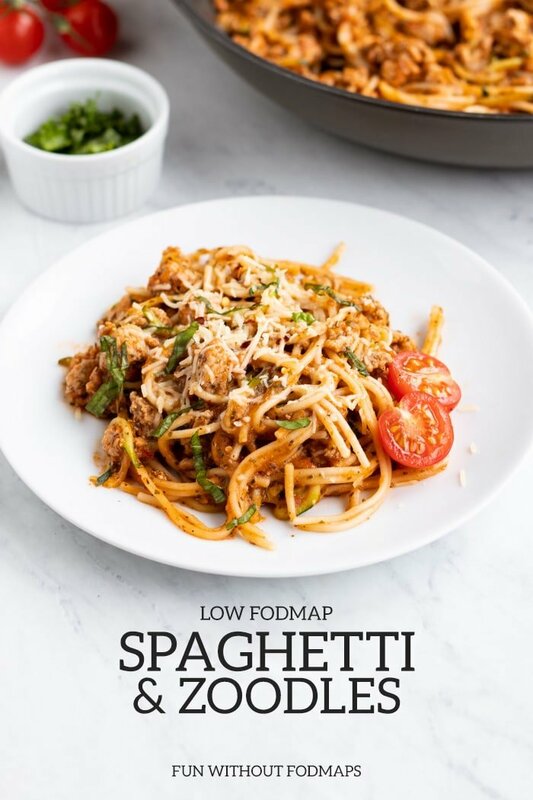 Use pre-made low FODMAP pasta sauce in place of the sauce created in step 2. 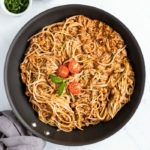 Some of my favorite FODMAP-friendly options: Fody Foods Low FODMAP Tomato & Basil Sauce (Monash certified) and Prego Sensitive Recipe Italian Sauce (FODMAP Friendly certified). 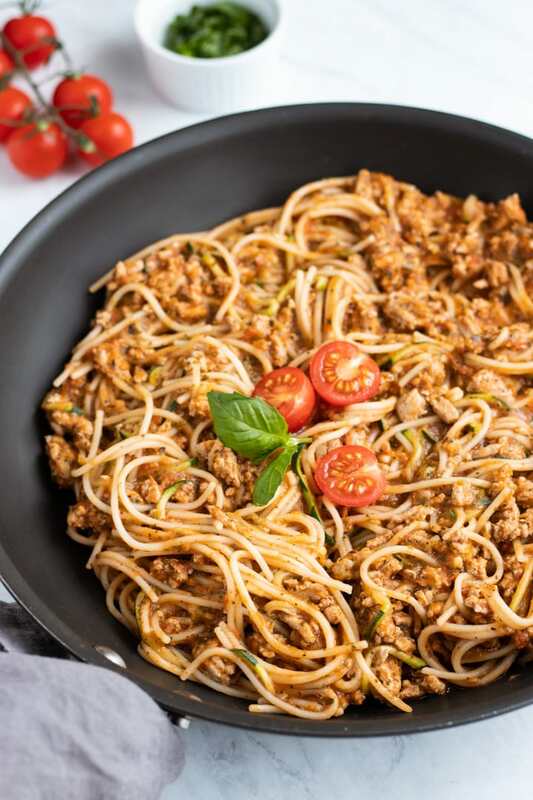 Brown Rice Spaghetti: Brown rice spaghetti is a type of gluten-free pasta. Gluten-free pasta is low FODMAP in 1 cup or 145-gram cooked servings. 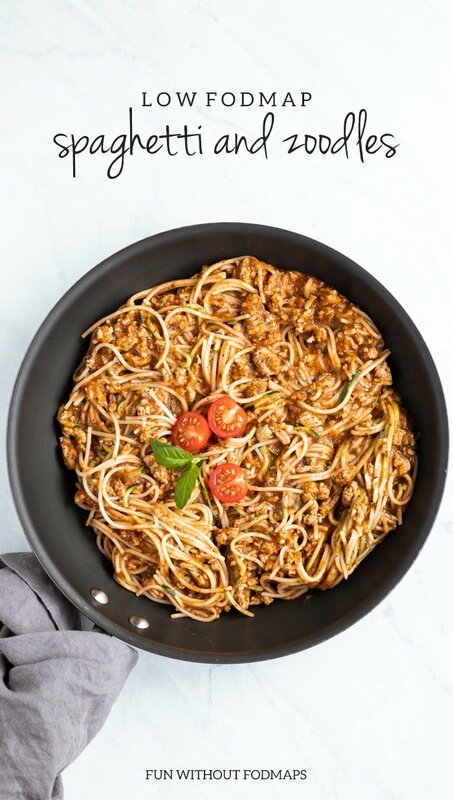 I like Tinkyada or Aldi’s liveGfree brown rice spaghetti. Leek Leaves: Only the leaves or green parts of the leek are low FODMAP. A low FODMAP serving is a ⅔ cup or 54 grams. Tomatoes: Not all tomatoes are created equal. Regular or common tomatoes have no detectable FODMAPs. Roma and cherry tomatoes have low FODMAP servings, however, they can become moderate/high FODMAP in large servings. Zucchini: A low FODMAP serve is 65 grams or ⅓ cup chopped. Note: This recipe was originally posted on March 6, 2017. It was modified and updated to reflect current low FODMAP recommendations on January 17, 2019. Love this t rcipe, I have not used spaghetti ,since i heard of zucchini noodels!!!! I just want to say thank you. I was diagnosed with colitis 4 years ago. My symptoms have been getting worse since June. I thought I was going to have to start giving myself (very expensive) shots of biologics because I was not responding to the medication I have been taking. But, the results of the colonoscopy showed my colitis had responded beautifully to the medication and I am completely in remission!! So, why I am still sick? The diet I have been following for 4 years is vastly different than the Low FODMAP diet. I will have to completely change my thought process as it relates to food and my ability to be comfortable in my own body. As we have all experienced, the panic and anxiety set in. And then I found this beautiful blog of yours full of delicious recipes. And you soothed my panic. I can do this and it will be delicious. Wow, Emily – what a health roller coaster it sounds like you’ve been on. I’m so sorry you have been dealing with all of this, but I am glad to hear that your body is responding positively to the medication and that you found the low FODMAP diet for IBS. 🙂 Thank YOU for the wonderful compliment. You really have no idea how much it means to me. I appreciate you taking the time to share your story and I agree – you CAN do this! Please let me know if there is anything I can maybe do to help make your low FODMAP journey easier. Is there pasta is this recipe? I’m a little confused… it says spaghetti and zoodles but I don’t see spaghetti in the list of ingredients or in the photo. Hi Gladine, You’re correct this recipe does not contain spaghetti pasta. I named it spaghetti to help people following a low FODMAP diet find a substitute a little more easily. We call it spaghetti and zoodles in our house, but instead of “and” it should probably have been “with zoodles” to be correct. Sorry for the confusion. 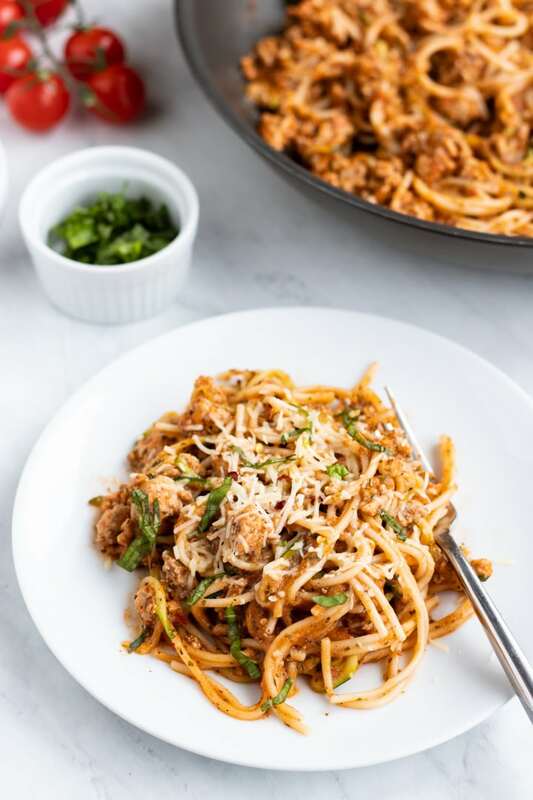 Cooked brown rice or quinoa spaghetti could definitely be added to this recipe. Thanks for your question and pointing this out.